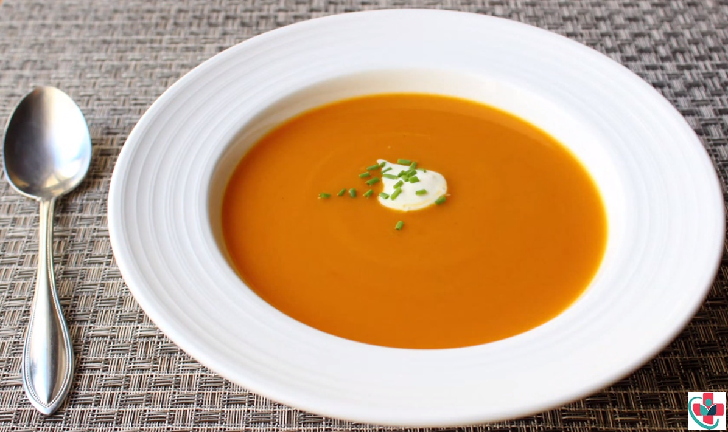 Here is a tasty creamy butternut coconut soup that will leave your taste buds excited. Hope you get to try the soup out at home. ⏩When you want to peel a butternut first clean and cut both ends to be able to make it sit when peeling it. ⏩Cut into two so that you have two pieces. ⏩With a sharp knife, start peeling along the curves of the butternut. You can also use a vegetable peeler. ⏩When done, you want to avoid the whitish or green streaks like above as they tend to be hard and take time to cook. Trim them off. ⏩Nice and ready. If you use a peeler to peel your butternut, You will be left with a lot of the green and white hard parts of the butternut. If you prefer the peeler, then peel it til it looks like the picture. ⏩Repeat the same on another piece while trying to cut along the curves of the butternut. ⏩Cut the bottom part into 2 to reveal the seeds. ⏩Using a spoon and a little muscle, scrape off the seeds and 'strings' Nice and clean. ⏩Dice the butternut to desired size ready for cooking. ⏩In a roasting pan, season the diced up butternut and add little oil. ⏩Into the hot oven, it goes at the highest heat you can set your oven. It should take about 30 minutes in the oven. ⏩After about 15 minutes, stir the butternut around to ensure all sides start to brown. ⏩If your oven, like mine, was not hot enough you could transfer the butternut to a hot pan and finish it there as you need to have blackened pieces to get that roast flavor. ⏩The pan should just have very little oil to prevent the butternut from sticking. ⏩If you DON'T' HAVE AN OVEN, you can cook the butternut in the pan over medium heat while covered then increase the heat to high to get the butternut brown. ⏩Roast Butternut. Whether you use a pan or oven, the idea is to have you butternut looking like this. ⏩Set it aside for use shortly. ⏩Meanwhile, have your onion, ginger, and garlic sliced and ready. Add more ginger or garlic if you want a ginger/garlic taste. ⏩Add the browned butternut and give a stir. ⏩Let to cook for about 1 minute. ⏩Add 750 ml of water. Bring to boil and simmer for about 5 minutes while covered. You can add coconut at this stage and if not sure how much is enough, you can always add more later. ⏩Turn off the heat and allow to cool slightly. ⏩Blend until smooth in batches if it can't fit your blender. ⏩Return to the heat and bring to boil, adding some coconut cream/milk to taste. ⏩Give a quick stir, taste and adjust the seasoning. ⏩Garnish with a swirl of cream and coriander leaf or onions. ⏩Also, you can try another serving suggestion since they are quite a number. Enjoy!! The dietary fiber can boost the immune system and prevent inflammation.